Friday at 1PM, Karl Urban shared his charm, exuberance, and talent with fans in the Centennial Room of the Hyatt. He began with a montage of impressions, including an exquisite use of the so-called Shatner comma. Urban has worked on countless genre projects – The Lord of the Rings trilogy, Star Trek, RED, Riddick, Dredd, Almost Human, and Xena: Warrior Princess to name a few. One audience member asked which of the scenes in The Lord of the Rings trilogies Urban enjoyed most. “The death of Boromir,” he said. “It was super smart to use such an emotional scene at the end of the movie,” when most films end with a big action scene. His playfulness on set and off shone through when he told a series of tales about the pranks that he and his driver played on each other at various times during shooting Almost Human. 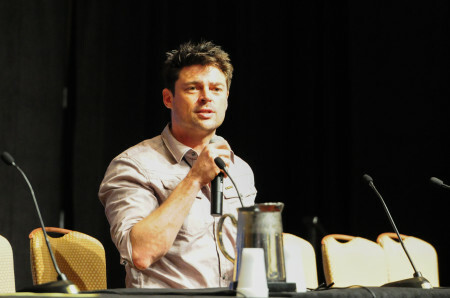 By the end of the panel, the audience (including this reporter) was pumped from the fun, the insight, the many impressions, but mostly from the genuine honesty and enthusiasm that this actor shared so generously with us.